Sliver Paddleboards started building boards with paper plans and we used them in the shop for our custom boards until we had in-house CNC capabilities. The precision CNC cut fishbone frame kits are much quicker to use but the result is virtually the same. We include the full-scale paper plan of every piece that makes up the internal framework. The paper plans are clearly marked with hole locations and notch depths to ensure everything fits perfectly. Cut out all the templates with scissors leaving them about 1/4″ oversized. 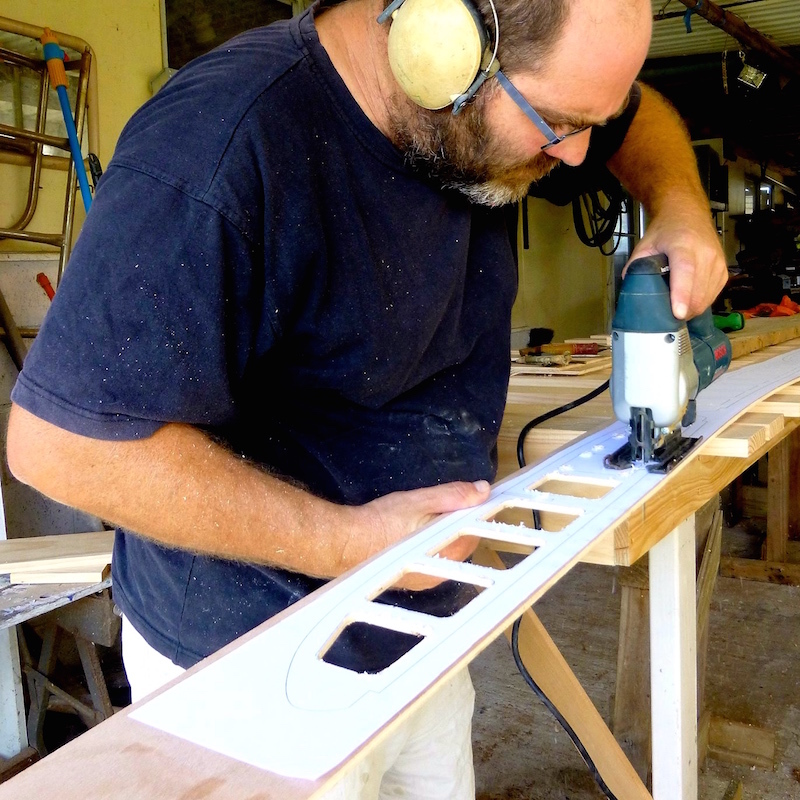 Arrange all the templates on the plywood leaving enough room between templates for cutting. Leave and extra 1/4″-1/2″ depending on your tools and skill level. Lift one piece at a time and spray a light layer of glue on plywood. Lay paper template in the fresh glue. Lightly smooth the template with plastic scraper or block of wood. This is to make sure the paper is flat and adheres well without any wrinkles. Using a bandsaw or jigsaw cut each template a little oversized making sure you are not too close to the lines. The goal is to leave some white paper on the outside of the black lines. 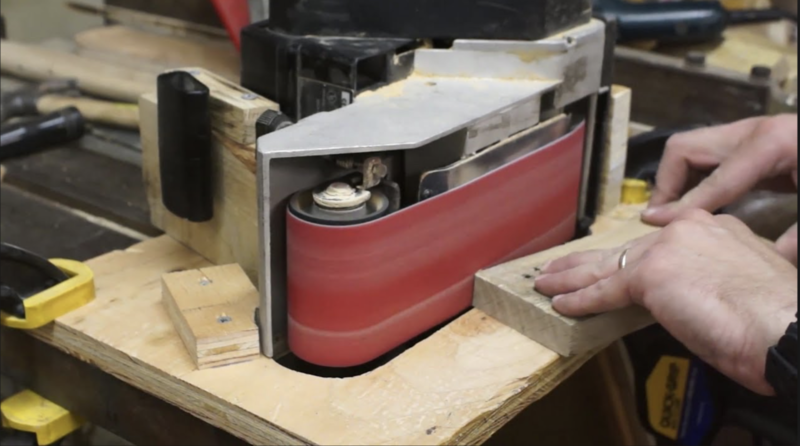 In the shop I use a bandsaw and leave and extra 1/16″ of an inch. Sand the templates back to the black line. The goal is to remove all the white and leave the black outline. In the shop we use an edge sander (Large belt sander with a table.) Any electric sander that can be held at a 90 degree angle would work. Cut the notches for the center spline and the notches for your first starter strip at the bottom of the rail. The notches should be friction fits so you are best to leave the lines and then adjust with sandpaper if needed. With a small piece of scrap plywood test each notch and adjust with sandpaper if necessary. Glue the two halves of your center spline together with some of the left over plywood. This area will end up being the location of the handle. I made an edge sander by simply laying combination sander on it’s side. 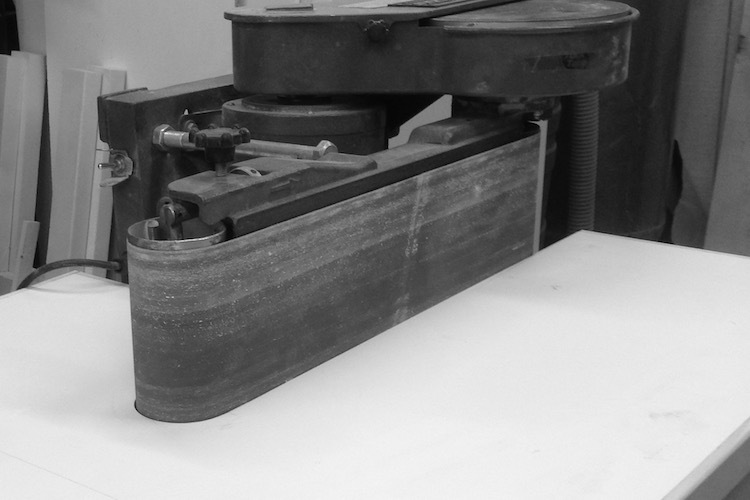 The sander rests on a couple of 2×4’s with support blocks holding it at the correct angle. The table is just a scrap of melamine that was rough cut and slid into place with the sander running. The same idea is pictured here with a belt sander.